Subjective Well-Being and Income: Is There Any Evidence of Satiation? Many scholars have argued that once basic needs have been met, higher income is no longer associated with higher in subjective well-being. We assess the validity of this claim in comparisons of both rich and poor countries, and also of rich and poor people within a country. Analyzing multiple datasets, multiple definitions of "basic needs" and multiple questions about well-being, we find no support for this claim. The relationship between well-being and income is roughly linear-log and does not diminish as incomes rise. If there is a satiation point, we are yet to reach it. Longer working paper version, which has more detail. Emotion, 12(6) 1181-1187, December 2012. 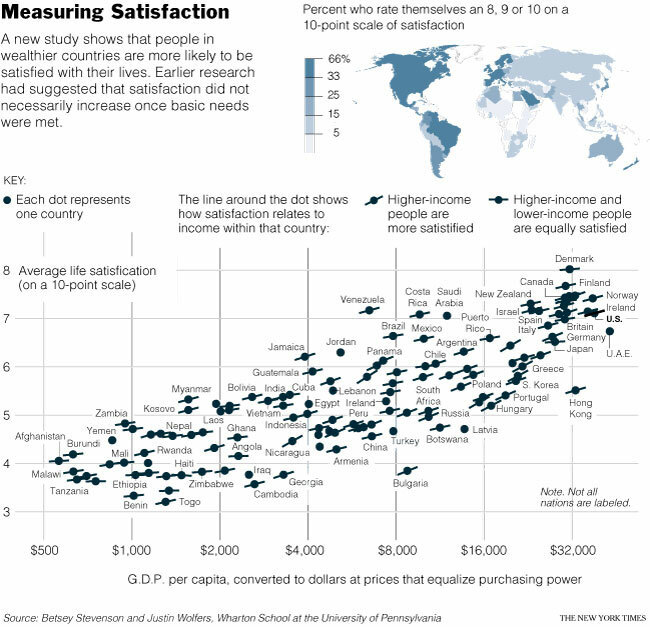 Economists in recent decades have turned their attention to data that asks people how happy or satisfied they are with their lives. Much of the early research concluded that the role of income in determining well-being was limited, and that only income relative to others was related to well-being. In this paper, we review the evidence to assess the importance of absolute and relative income in determining well-being. Our research suggests that absolute income plays a major role in determining well-being and that national comparisons offer little evidence to support theories of relative income. We find that well-being rises with income, whether we compare people in a single country and year, whether we look across countries, or whether we look at economic growth for a given country. Through these comparisons we show that richer people report higher well-being than poorer people; that people in richer countries, on average, experience greater well-being than people in poorer countries; and that economic growth and growth in well-being are clearly related. Moreover, the data show no evidence for a satiation point above which income and well-being are no longer related. Subjective well-being data reveal that blacks are less happy than are whites. However, much of this racial gap in happiness has closed over the past 35 years. We investigate measures of subjective well-being that indicate that the well-being of blacks has increased both absolutely and relative to whites. These changes in well-being are found across various datasets and measures of subjective well-being. However the gains in happiness are concentrated among women and those living in the south. While the opportunities and achievements of blacks have improved over this period, the happiness gains far exceed that which can be attributed to these objective improvements. We explore the relationships between subjective well-being and income, as seen across individuals within a given country, between countries in a given year, and as a country grows through time. We show that richer individuals in a given country are more satisfied with their lives than are poorer individuals, and establish that this relationship is similar in most countries around the world. Turning to the relationship between countries, we show that average life satisfaction is higher in countries with greater GDP per capita. The magnitude of the satisfaction-income gradient is roughly the same whether we compare individuals or countries, suggesting that absolute income plays an important role in influencing well-being. Finally, studying changes in satisfaction over time, we find that as countries experience economic growth, their citizens' life satisfaction typically grows, and that those countries experiencing more rapid economic growth also tend to experience more rapid growth in life satisfaction. These results together suggest that measured subjective well-being grows hand in hand with material living standards. By most objective measures the lives of women in the United States have improved over the past 35 years, yet we show that measures of subjective well-being indicate that women's happiness has declined both absolutely and relative to male happiness. The paradox of women's declining relative well-being is found examining multiple countries, datasets, and measures of subjective well-being, and is pervasive across demographic groups. Relative declines in female happiness have eroded a gender gap in happiness in which women in the 1970s typically reported higher subjective well-being than did men. These declines have continued and a new gender gap is emerging—one with higher subjective well-being for men. Our findings raise provocative questions about the contribution of the women's movement to women's welfare and about the legitimacy of using subjective well-being to assess broad social changes. This paper examines how the level and dispersion of self-reported happiness has evolved over the period 1972-2006. While there has been no increase in aggregate happiness, inequality in happiness has fallen substantially since the 1970s. There have been large changes in the level of happiness across groups: Two-thirds of the black-white happiness gap has been eroded, and the gender happiness gap has disappeared entirely. Paralleling changes in the income distribution, differences in happiness by education have widened substantially. We develop an integrated approach to measuring inequality and decomposing changes in the distribution of happiness, finding a pervasive decline in within-group inequality during the 1970s and 1980s that was experienced by even narrowly-defined demographic groups. Around one-third of this decline has subsequently been unwound. Juxtaposing these changes with large rises in income inequality suggests an important role for non-pecuniary factors in shaping the well-being distribution. Brookings Papers on Economic Activity, Spring 2008. The "Easterlin paradox" suggests that there is no link between a society's economic development and its average level of happiness. We re-assess this paradox analyzing multiple rich datasets spanning many decades. Using recent data on a broader array of countries, we establish a clear positive link between average levels of subjective well-being and GDP per capita across countries, and find no evidence of a satiation point beyond which wealthier countries have no further increases in subjective well-being. We show that the estimated relationship is consistent across many datasets and is similar to the relationship between subject well-being and income observed within countries. Finally, examining the relationship between changes in subjective well-being and income over time within countries we find economic growth associated with rising happiness. Together these findings indicate a clear role for absolute income and a more limited role for relative income comparisons in determining happiness. A digestible summary (six parts): 1, 2, 3, 4, 5, 6. And in Council on Foreign Relations Conference volume, "Stabilizing the Economy". This paper analyzes the effects of business cycle volatility on measures of subjective wellbeing, including self-reported happiness and life satisfaction. I find robust evidence that inflation, and particularly unemployment, lower perceived wellbeing. Conditional on levels of unemployment and inflation, greater macroeconomic volatility undermines wellbeing. These effects are moderate but important: eliminating unemployment volatility would raise wellbeing by an amount roughly equal to that from lowering unemployment by a quarter of a percentage point. The effects of inflation volatility on wellbeing are less easy to detect and are likely smaller. We document that trust in public institutions and particularly trust in banks, business and government has declined over recent years. U.S. time series evidence suggests that this partly reflects the pro-cyclical nature of trust in institutions. Cross-country comparisons reveal a clear legacy of the Great Recession, and those countries whose unemployment grew the most suffered the biggest loss in confidence in institutions, particularly in trust in government and the financial sector. Finally, analysis of several repeated cross-sections of confidence within U.S. states yields similar qualitative patterns, but much smaller magnitudes in response to state-specific shocks. Journal of Monetary Economics, 54: 37-55, September 2007. When similar patterns of expansion and contraction are observed across sectors, we call this a business cycle. Yet explaining the similarity and synchronization of these cycles across industries remains a puzzle. Whereas output growth across industries is highly correlated, identifiable shocks, like shocks to productivity, are far less correlated. While previous work has examined complementarities in production, we propose that sectors make similar input decisions because of complementarities in information acquisition. Because information about driving forces has a high fixed cost of production and a low marginal cost of replication, it can be more efficient for firms to share the cost of discovering common shocks than to invest in uncovering detailed sectoral information. Firms basing their decisions on this common information make highly correlated production choices. This mechanism amplifies the effects of common shocks, relative to sectoral shocks. NBER International Seminar on Macroeconomics, 2005. In September 2002, a new market in "Economic Derivatives" was launched allowing traders to take positions on future values of several macroeconomic data releases. We provide an initial analysis of the prices of these options. We find that market-based measures of expectations are similar to survey-based forecasts although the market-based measures are somewhat more accurate better predict financial market responses to surprises in data. These markets also provide implied probabilities of the full range of specific outcomes, allowing us to measure uncertainty, assess its driving forces, and comparing this measure of uncertainty with the dispersion of point-estimates among individual forecasters (a measure of disagreement). We also assess the accuracy of market-generated probability density forecasts. A consistent theme is that few of the behavioral anomalies present in surveys of professional forecasts survive in equilibrium, and these markets are remarkably well calibrated. Finally we assess the role of risk, finding little evidence that risk-aversion drives a wedge between market prices and probabilities in this market. Bloomberg TV "Bloomberg on Markets"
Analyzing 50 years of inflation expectations data from several sources, we document substantial disagreement among both consumers and professional economists about expected future inflation. Moreover, this disagreement shows substantial variation through time, moving with inflation, the absolute value of the change in inflation, and relative price variability. We argue that a satisfactory model of economic dynamics must speak to these important business cycle moments. Noting that most macroeconomic models do not endogenously generate disagreement, we show that a simple “sticky-information” model broadly matches many of these facts. Moreover, the sticky-information model is consistent with other observed departures of inflation expectations from full rationality, including autocorrelated forecast errors and insufficient sensitivity to recent macroeconomic news. Research Handbook in the Law and Economics of the Family, Edward Elgar Press, 2011. Recent reports about the stability of marriages appear to yield conflicting conclusions. We reconcile these estimates, showing that data from several sources uniformly point to increasing marital stability among those married since the mid-late 1970s. Published, Journal of Economic Perspectives, 21(2) 27-52, Spring 2007. We document marriage and divorce behavior, comparing trends through the past 150 years and outcomes across demographic groups and countries. While divorce rates have risen over the past 150 years, they have been falling for the past quarter century. Marriage rates have also been falling, but more strikingly, the importance of marriage at different points in the life cycle has changed, reflecting rising age at first marriage, rising divorce followed by high remarriage rates, and a combination of increased longevity with a declining age gap between husbasnds and wives. Cohabitation has also become increasingly important, emerging as a widely used step on the path to marriage. Out-of-wedlock fertility has also risen, consistent with declining "shotgun marriages". Compared with other countries, marriage maintains a central role in American life. We then turn to documenting some of the driving forces causing these changes in the marriage market: the rise of the pill and women's control over their own fertility; sharp changes in wage structure, including a rise in inequality and partial closing of the gender wage gap; dramatic changes in home production technologies; and the emergence of the internet as a new matching technology. Finally, we discuss how these facts should inform family policy debates. Published, American Economic Review, 96(5), December 2006, 1802-1820. Becker has argued that the rise in divorce rates over the last thirty years does not reflect liberalized divorce laws. His argument rests on a basic application of the Coase theorem to marital bargaining. Each iteration of the ensuing empirical literature has come to a different conclusions. This paper reconciles these various estimates, showing that differences reflect a failure to carefully consider both the political endogeneity of these decisions, and the dynamic response of divorce rates to a regime change. New estimates suggest that unilateral divorce laws led to a large increase in divorce rates that lasted about a decade, followed by a significant reversal. Data appendix, dataset and Stata programs. Over the past thirty years changes in divorce law have significantly increased access to divorce. The different timing of divorce law reform across states provides a useful quasi-experiment with which to examine the effects of this change. We analyze state panel data to estimate changes in suicide, domestic violence and spousal murder rates arising from the change in divorce law. Suicide rates are used as a quantifiable measure of happiness and well-being, albeit one that focuses on the extreme lower tail of the distribution. We find a large, statistically significant, and econometrically robust decline in the number of women committing suicide following the introduction of unilateral divorce. No significant effect is found for men. Domestic violence is analyzed using both data on family conflict resolution, and intimate homicide rates. The results indicate a large decline in domestic violence for both men and women in states that adopted unilateral divorce. We find suggestive evidence that unilateral divorce led to a decline in females murdered by their partners, while the data revealed no discernible effects for men murdered. In sum, we find strong evidence that legal institutions have profound real effects on outcomes within families. Link to Data appendix, dataset and Stata programs. Two key facts about European unemployment must be explained: the rise in unemployment since the 1960s, and the heterogeneity of individual country experiences. While adverse shocks can potentially explain much of the rise in unemployment, there is insufficient heterogeneity in these shocks to explain cross-country differences. Alternatively, while explanations focusing on labor market institutions explain cross-country differences well, many of these institutions pre-date the rise in unemployment. Based on a panel of institutions and shocks for 20 OECD nations since 1960, we find that the interaction between shocks and institutions is crucial to explaining both stylized facts. Our first specification assumes that there are common, but unobservable, shocks across countries; we find that these shocks have a larger and more persistent effect in countries with poor labor market institutions. Our second specification constructs series for the macro shocks, and again finds evidence that the same size shock has differential effects on unemployment when labor market institutions differ. These findings suggest that institutions determine the relevance of the unemployed to wage-setting, thereby determining the evolution of equilibrium unemployment rates following a shock. Theory implies that employment protection will unambiguously decrease job flows. However, cross-country comparisons of annual rates of job reallocation seem to show that employment protection has no discernible effect on job flows. This paper presents a model that shows that employment protection does not significantly alter a firm’s response to highly persistent shocks such as those present in annual data. By contrast, quarterly job flows will reflect highly transitory shocks such as those associated with the seasonal cycle. It is here that employment protection should reduce job flows. Testing this hypothesis requires a consistent set of cross-country set of quarterly job flows. In the absence of such data, this paper takes a novel approach, manipulating available household survey data. Specifically, a measure of job flows caused by the seasonal cycle is constructed. Analyzing these flows across 14 OECD countries, employment protection is shown to have significant and economically meaningful effects on job flows. Indeed, the size of the effect is sufficient to confirm Blanchard and Portugal’s hypothesis that it is employment protection that explains the different pattern of labor turnover between Portugal and the USA. Most pollsters base their election projections off questions of voter intentions, which ask "If the election were held today, who would you vote for?" By contrast, we probe the value of questions probing voters' expectations, which typically ask: "Regardless of who you plan to vote for, who do you think will win the upcoming election?" We demonstrate that polls of voter expectations consistently yield more accurate forecasts than polls of voter intentions. A small-scale structural model reveals that this is because we are polling from a broader information set, and voters respond as if they had polled twenty of their friends. This model also provides a rational interpretation for why respondents' forecasts are correlated with their expectations. We also show that we can use expectations polls to extract accurate election forecasts even from extremely skewed samples. Quarterly Journal of Political Science, 2(3) 277-286, August 2007. To understand the extent to which partisan majorities in Congress influence economic policy, we compare financial market responses in recent midterm elections to Presidential elections. We use prediction markets tracking election outcomes as a means of precisely timing and calibrating the arrival of news, allowing substantially more precise estimates than a traditional event study methodology. We find that equity values, oil prices, and Treasury yields are slightly higher with Republican majorities in Congress, and that a switch in the majority party in a chamber of Congress has an impact that is only 10-30 percent of that of the Presidency. We also find evidence inconsistent with the popular view that divided government is better for equities, finding instead that equity valuations increase monotonically, albeit slightly, with the degree of Republican control. Quarterly Journal of Economics, May 2007, 122(2) 807-829. Political economists interested in discerning the effects of election outcomes on the economy have been hampered by the problem that economic outcomes also influence elections. We sidestep these problems by analyzing movements in economic indicators caused by clearly exogenous changes in expectations about the likely winner during election day. Analyzing high frequency financial fluctuations on November 2 and 3 in 2004, we find that markets anticipated higher equity prices, interest rates and oil prices and a stronger dollar under a Bush presidency than under Kerry. A similar Republican-Democrat differential was also observed for the 2000 Bush-Gore contest. Prediction market based analyses of all Presidential elections since 1880 also reveal a similar pattern of partisan impacts, suggesting that electing a Republican President raises equity valuations by 2‑3 percent, and that since Reagan, Republican Presidents have tended to raise bond yields. Economica, 76(302): 225-250; April 2009. Market prices incorporate large amounts of information, and our aim in this paper is to demonstrate that prediction markets can help extract this information, prospectively allowing this aggregated expertise to inform policy decisions in real-time. We provide a case study, exploiting data from a market trading in contracts which paid off if Saddam Hussein was removed as leader of Iraq, to learn about financial market participants’ expectations of the consequences of the 2003 Iraq war. We conducted an ex-ante analysis, which we disseminated before the war, finding that a 10 percent increase in the probability of war was accompanied by a $1 increase in spot oil prices that futures markets suggested was expected to dissipate quickly. Equity prices movements implied that the same shock led to a 1½ percent decline in the S&P 500. Further, the existence of widely-traded options allows us to back out the entire distribution of market expectations of the war’s near-term effects, finding that these large effects reflected a negatively skewed distribution, with a substantial probability of an extremely adverse outcome. The flow of war-related news through our sample explains a large proportion of daily oil and equity price movements. Subsequent analysis suggests that these relationships continued to hold out-of-sample. Our analysis also allows us to characterize which industries and countries were most sensitive to war news, and when the war turned out somewhat better than ex-ante expectations, these sectors recovered, confirming these cross-sectional implications. We highlight the particular features of this case study that make it particularly amenable to this style of policy analysis, and discuss some of the issues in applying this method to other policy contexts. Are voters rational? Standard agency theory suggests that rational voters will seek to re-elect politicians who deliver	favorable outcomes. A second implication is that it makes little sense to re-elect politicians following good outcomes that are not a reflection of their competence. Indeed, rational voters will filter such exogenous shocks from their assessments in order to avoid electing incompetent, but lucky, politicians. This paper measures the extent to which voters in state gubernatorial elections irrationally attribute credit to the state governor for economic fluctuations unrelated to their actions. Simple tests of relative performance evaluation reveal that voters evaluate their state’s economic performance relative to the national economy. However, this is only evidence of rule-of-thumb performance filtering. More sophisticated tests reveal that voters in pro-cyclical states are consistently fooled into re-electing incumbents during national booms, only to dump them during national recessions. Similarly, voters in oil-producing states tend to re-elect incumbent governors during oil price rises, and vote them out of office when the oil price drops. Consonant with an emerging behavioral literature, this suggests that voters make systematic attribution errors and are best characterized as quasi-rational. American Law and Economics Review (2009) 11(2):249-309. This paper reviews the econometric issues in efforts to estimate the impact of the death penalty on murder, focusing on six recent studies published since 2003. We highlight the large number of choices that must be made when specifying the various panel data models that have been used to address this question. There is little clarity about the knowledge potential murderers have concerning the risk of execution: are they influenced by the passage of a death penalty statute, the number of executions in a state, the proportion of murders in a state that leads to an execution, and details about the limited types of murders that are potentially susceptible to a sentence of death? If an execution rate is a viable proxy, should it be calculated using the ratio of last years executions to last years murders, last years executions to the murders a number of years earlier, or some other values? We illustrate how sensitive various estimates are to these choices. Importantly, the most up-to-date OLS panel data studies generate no evidence of a deterrent effect, while three 2SLS studies purport to find such evidence. The 2SLS studies, none of which shows results that are robust to clustering their standard errors, are unconvincing because they all use a problematic structure based on poorly measured and theoretically inappropriate pseudo-probabilities that are designed to capture the key deterrence elements of a states death penalty regime, and because their instruments are of dubious validity. We also discuss the appropriateness of the implicit assumption of the 2SLS studies that OLS estimates of the impact of the death penalty would be biased against a finding of deterrence. Stanford Law Review (2005) 58:791-846. Also reprinted in Economics of Criminal Law, Steven Levitt and Thomas Miles (eds), 2008, Elgar Publishing. Does the death penalty save lives? A surge of recent interest in this question has yielded a series of papers that purport to show robust and precise estimates of a substantial deterrent effect of capital punishment. We assess the various approaches that have been used in this literature, testing the robustness of these inferences. Specifically, we start by assessing the time series evidence, comparing the history of executions and homicides in the United States and Canada, and within the United States, between executing and non-executing states. We analyze the effects of the judicial experiments provided by the 1972 Furman and 1976 Gregg decisions and assess the relationship between execution and homicide rates in state panel data since 1934. We then revisit the existing instrumental variables approaches and assess two recent state-specific execution moratoria. In each case, we find that previous inferences of large deterrent effects based upon specific samples, functional forms, control variables, comparison groups, or IV strategies are extremely fragile and that even small changes in specifications yield dramatically different results. The fundamental difficulty facing the econometrician is that the death penalty - at least as it has been implemented in the United States - is applied so rarely that the number of homicides that it can plausibly have caused or deterred cannot be reliably disentangled from the large year-to-year changes in the homicide rate caused by other factors. As such, short samples and particular specifications may yield large but spurious correlations. We conclude that existing estimates appear to reflect a small and unrepresentative sample of the estimates that arise from alternative approaches. Sampling from the broader universe of plausible approaches suggests not just reasonable doubt about whether there is any deterrent effect of the death penalty, but profound uncertainty - even about its sign. Link to Donohue and Wolfers dataset (and other death penalty data). An executive summary;	Paul Rubin's response; Our our rejoinder,	followed by his rejoinder. Quarterly Journal of Economics, 125(4):1859-1887. The NBA provides an intriguing place to test for taste-based discrimination: referees and players are involved in repeated interactions in a high-pressure setting with referees making the type of split-second decisions that might allow implicit racial biases to become evident. Moreover, the referees receive constant monitoring, and feedback on their performance. (Commissioner Stern has claimed that NBA referees "are the most ranked, rated, reviewed, statistically analyzed and mentored group of employees of any company in any place in the world.") The essentially arbitrary assignment of refereeing crews to basketball games, and the number of repeated interactions allow us to convincingly test for own-race preferences. We find that - even conditioning on player and referee fixed effects (and specific game fixed effects) - that more personal fouls are awarded against players when they are officiated by an opposite-race officiating crew than when officiated by an own-race refeeing crew. These biases are sufficiently large that we find appreciable differences in whether predominantly black teams are more likely to win or lose, according to the racial composition of the refereeing crew. Can raising awareness of racial bias subsequently reduce that bias? We address this question by exploiting the widespread media attention highlighting racial bias among professional basketball referees that occurred in May 2007 following the release of an academic study. Using new data, we confirm that racial bias persisted in the years after the study's original sample, but prior to the media coverage. Subsequent to the media coverage though, the bias completely disappeared. We examine potential mechanisms that may have produced this result and find that the most likely explanation is that upon becoming aware of their biases, individual referees changed their decision-making process. These results suggest that raising awareness of even subtle forms of bias can bring about meaningful change. In a recent study, we used National Basketball Association (NBA) box-score data a 13-year period including nearly 600,000 foul calls to show that NBA referees call relatively more fouls on players of another race. The NBA commissioned its own study using internal data with information on calls made by individual referees and claimed the results show there is no bias among the referees in the NBA. This paper is an attempt to reconcile these competing claims. Journal of Quantitative Analysis in Sports, 4(2), 2008. Recent studies have documented the existence of an own-race bias on the part of sports officials. In this paper we explore the implications of these biases on betting markets. We use data from the 1991/92-2004/05 NBA regular seasons to show that a betting strategy exploiting own-race biases by referees would systematically beat the spread. Published, Journal of the European Economic Association, 4(2-3), May 2006. A vast labor literature has found evidence of a "glass ceiling", whereby women are under-represented among senior management. A key question remains the extent to which this reflects unobserved differences in productivity, preferences, prejudice, or systematically biased beliefs about the ability of female managers. Disentangling these theories would require data on productivity, on the preferences of those who interact with managers, and on perceptions of productivity. Financial markets provide continuous measures of the market's perception of the value of firms, taking account of the beliefs of market participants about the ability of the men and women in senior management. As such, financial data hold the promise of potentially providing insight into the presence of mistake-based discrimination. Specifically if female-headed firms were systematically under-estimated, this would suggest that female-headed firms would outperform expectations, yielding excess returns. Examining data on S&P 1500 firms over the period 1992-2004 I find no systematic differences in returns to holding stock in female-headed firms, although this result reflects the weak statistical power of our test, rather than a strong inference that financial markets either do or do not under-estimate female CEOs. Download dataset and Stata programs. Science, 320, p.877, May 16 2008. Reviews the extant literature on prediction markets, and how they can be harnessed for use in both public policy and business settings. We assess current legal impediments to the adoption of prediction markets, and describe how CFTC regulation may create a more useful regulatory environment. This review paper articulates the relationship between prediction market data and event studies, with a special focus on applications in political economy. Event studies have been used to address a variety of political economy questions|from the economic effects of party control of government to the importance of complex rules in congressional committees. However, the results of event studies are notoriously sensitive to both choices made by researchers and external events. Specifically, event studies will generally produce different results depending on three interrelated things: which event window is chosen, the prior probability assigned to an event at the beginning of the event window, and the presence or absence of other events during the event window. In this paper we show how each of these may bias the results of event studies, and how prediction markets can mitigate these biases. American Economic Review 96(2), May 2006. Point-spread betting on NCAA basketball yields incentives for players and gamblers that are both asymmetric and highly non-linear, thereby encouraging mutually beneficial effort manipulation through "point shaving". This paper assesses game outcomes and point spreads from over 40,000 games between 1989 and the present, finding that there exists a "prima facie" case that point shaving is surprisingly widespread. Prediction Markets, sometimes referred to as "information markets," "idea futures" or "event futures", are markets where participants trade contracts whose payoffs are tied to a future event, thereby yielding prices that can be interpreted as market-aggregated forecasts. This article summarizes the recent literature on prediction markets, highlighting both theoretical contributions that emphasize the possibility that these markets efficiently aggregate disperse information, and the lessons from empirical applications which show that market-generated forecasts typically outperform most moderately sophisticated benchmarks. Along the way, we highlight areas ripe for future research. Video of a talk given to the New Horizons in Science Briefing. Explaining the Favorite-Longshot Bias: Is it Risk-Love, or Misperceptions? Journal of Political Economy, August 2010, 118(4) 723-746. The favorite-longshot bias presents a challenge for theories of decision making under uncertainty: This longstanding empirical regularity is that betting odds provide biased estimates of the probability of a horse winning, and longshots are overbet, while favorites are underbet. Neoclassical explanations have rationalized this puzzle by appealing to rational gamblers who overbet longshots due to risk-love, or alternatively information asymmetries. The competing behavioral explanations emphasize the role of misperceptions of probabilities. We provide a novel empirical test that can differentiate these competing theories, focusing on the pricing of compound or "exotic" bets. We test whether the model that best explains gamblers' choices in one part of their choice set (betting to win) can also rationalize decisions over a wider choice set, including betting in the win, exacta, quinella or trifecta pools. We have a new large-scale dataset ideally suited to test these predictions and find evidence in favor of the view that misperceptions of probability drive the favorite-longshot bias, as suggested by Prospect Theory. Along the way we provide more robust evidence on the favorite-longshot bias, falsifying the conventional wisdom that the bias is large enough to yield profit opportunities (it isn't) and that it becomes more severe in the last race (it doesn't). Information Markets: A New Way of Making Decisions in the Public and Private Sectors, AEI-Brookings Press, eds: Robert Hahn and Paul Tetlock. Interest in prediction markets has increased in the last decade, driven in part by the hope that these markets will prove to be valuable tools in forecasting, decision-making and risk management - in both the public and private sectors. This paper outlines five open questions in the literature, and we argue that resolving these questions is crucial to determining whether current optimism about prediction markets will be realized. Download a copy of the whole book. Journal of Economic Perspectives, 18(2), Spring 2004. We analyze the extent to which simple markets can be used to aggregate disperse information into efficient forecasts of unknown future events. Drawing together data from a range of prediction contexts, we show that market-generated forecasts are typically fairly accurate, and they outperform most moderately sophisticated benchmarks. Carefully designed contracts can yield insight into the market's expectations about not only probabilities, means and medians, and also uncertainty about these parameters. Moreover, conditional markets can effectively reveal the market's beliefs about regression coefficients, although we still have the usual problem of disentangling correlation from causation. We discuss a number of market design issues and highlight domains in which prediction markets are most likely to be useful. Electronic Markets, 14(3), September 2004. The accuracy of prediction markets has been documented for both markets based on real-money and those based on play-money. To test how much extra accuracy can be obtained by using real money versus play-money, we set up a real-world on-line experiment pitting the predictions of TradeSports.com (real-money) against those of NewsFutures.com (play-money) regarding American Football outcomes during the fall/winter 2003 NFL season. As expected, both types of markets exhibited significant prediction powers, and remarkable performance compared to individual humans. But, perhaps surprisingly, the play-money markets did not perform any worse than the real-money markets. We speculate that this result reflects two opposing forces: real-money markets may better motivate information discovery while play-money market may yield more efficient information aggregation. Australian Economic Review, June 2006. In "Happiness and the Human Development Index: The Paradox of Australia," Blanchflower and Oswald (2005) observe an apparent puzzle: they claim that Australia ranks highly in the Human Development Index (HDI), but relatively poorly in happiness. However, when we compare their happiness data with the HDI, Australia appears happier, not sadder, than its HDI score would predict. This conclusion also holds when we turn to a larger cross-national dataset than the one used by Blanchflower and Oswald, when we analyse life satisfaction in place of happiness, and when we measure development using GDP per capita in place of the HDI. Indeed, in the World Values Survey, only one other country (Iceland) has a significantly higher level of both life satisfaction and happiness than Australia. Our findings accord with numerous cross-national surveys conducted since the 1940s, which have consistently found that Australians report high levels of wellbeing. Economic Record 82(258), September 2006. We review the efficacy of three approaches to forecasting elections: econometric models that project outcomes on the basis of the state of the economy; public opinion polls; and election betting (prediction markets). We assess the efficacy of each in light of the 2004 Australian election. This election is particularly interesting both because of innovations in each forecasting technology, and also because the increased majority achieved by the Coalition surprised most pundits. While the evidence for economic voting has historically been weak for Australia, the 2004 election suggests an increasingly important role for these models. The performance of polls was quite uneven, and predictions both across pollsters, and through time, vary too much to be particularly useful. Betting markets provide an interesting contrast, and a slew of data from various betting agencies suggests a more reasonable degree of volatility, and useful forecasting performance both throughout the election cycle and across individual electorates. How best to predict Australian federal election results? We analyze three forecasting tools – opinion polls, economic models, and betting odds. Historically, we find that opinion polls taken close to the election are quite accurate, while economic models provide better medium-run forecasts. The 2001 election largely follows this pattern, although the economic models provided more accurate projections than recorded through the 1990s. Against these, we compare betting odds, analyzing a rich data source from one of Australia’s largest bookmakers, Centrebet. The betting market not only correctly forecast the election outcome, but also provided very precise estimates of outcomes in a host of individual electorates. Betting fluctuations provide an intriguing quantitative record of the shifting fortunes of the campaign. We conclude that – particularly in marginal seats – the press may have better served its readers by reporting betting odds than by conducting polls. Comment on Jeremy Greenwood and Nezih Guner's "Marriage and Divorce Since World War II: Analyzing the Role of Technological Progress on the Formation of Households"
NBER Macroeconomics Annual, April 4, 2008. Prepared for Olivier Blanchard Retirement Celebration, MIT, June 4, 2016. NBER Summer Institute, Law and Economics, Cambridge, July 23, 2015. NBER Summer Institute, Economics of National Security, Cambridge, July 20, 2015. American Economics Association Annual Meeting, Boston, January 3, 2015. "Capital in the Twenty-First Century"
Prepared for CBO Adviser's Meeting, Washington DC, June 13, 2014. "Views among Economists: Professional Consensus or Point-Counterpoint?" American Economics Association Annual Meeting, San Diego, January 5, 2013. "Economic Experts vs. Average Americans"
"Does the Gender of Directors Matter?" American Economics Association Annual Meeting, San Diego, January 4, 2013. "A Female Style in Corporate Leadership? Evidence from Quotas"
NBER Law and Economics Summer Institute, Cambridge, July 28, 2011. "The Industrial Organization of Rebellion: The Logic of Forced Labor and Child Soldiering"
American Economics Association Annual Meeting, Atlanta, January 3, 2009. "Litigation Risk and Executive Compensation"
NBER Law and Economics Summer Institute, Cambridge, July 22, 2009. "The Political Economy of the U.S. Mortgage Default Crisis"
NBER Monetary Economics Spring Meeting, New York, March 20, 2009. "The Effects of Judge, Prosecutor, and Defendant Race and Gender Interactions on Defendant Outcomes"
American Economics Association Annual Meeting, San Francisco, January 3, 2008. "What can survey forcasts tell us about informational rigidities?" NBER Monetary Economics Fall Meeting, Cambridge, November 13, 2008. "From the 'Econometrics of Capital Punishment' to the 'Capital Punishment' of Econometrics"
"Lines in the Sand: Economic Integration and Disintegration of Post-War Iraq"
NBER Economics of National Security Summer Institute, Cambridge, July 25, 2008. "Testing the Efficiency of Markets in the 2002 World Cup"
American Economic Association Meetings, New Orleans, January 4, 2008. "Do Monetary Policy Committees Need Leaders? A Report on an Experiment"
"Exchange-Rate Policy Attitudes: Direct Evidence from Survey Data"
"Do Judges Vary in their Treatment of Race?" Conference on Empirical Legal Studies, New York, November 9, 2007. "The Simple Economics of Extortion: Evidence from Trucking in Aceh"
NBER Economics of Crime Working Group, Cambridge, September 14, 2007. "Decision-Making Under a Norm of Consensus: A Structural Analysis of Three-Judge Panels"
NBER Summer Institute - Law and Economics, Cambridge, July 31, 2007. NBER Summer Institute - Political Economy, Cambridge, July 17, 2007. 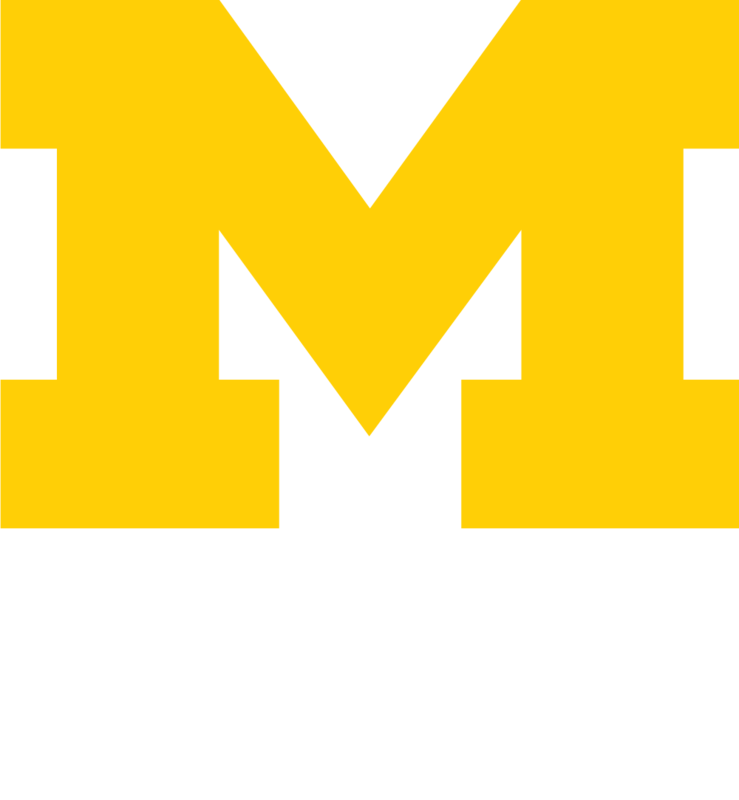 Workshop on The Growth of Gambling and Prediction Markets: Economic and Financial Implications, U.C. Riverside, May 21, 2007. Society of Labor Economists Annual Meetings, Chicago, May 4, 2007. "Notes on the Econometric Analysis of Crime"
Workshop on Understanding Crime Trends, Committee on Law and Justice, National Academies of Science and Engineering, Washington D.C., April 24, 2007. "Mismatch in Law School" and "Affirmative Action in Law School Admissions: What Do Racial Preferences Do?" NBER Law and Economics Spring Meeting, Cambridge, March 1, 2007. "The Evolution of National Retail Chains: How We Got Here"
American Economic Association Annual Meetings, Chicago, January 7, 2007. "Who Suffered from Superstition in the Marriage Market: The Case of Hinoeuma in Japan"
"Understanding the Evolution of Wage and Productivity Dispersion: Cross Country Evidence"
"em>Global Network on Inequality Conference on "New Directions in Inequality and Stratification", Princeton, April 8, 2006. "Measuring Trends in Leisure: The Allocation of Time over Five Decades"
San Francisco Federal Reserve Bank Conference on "Labor Markets and the Macroeconomy", San Francisco, March 3, 2006. "Dating Markets - Theory and Experimental Evidence"
American Economic Association Annual Meetings, Boston, January 6, 2006. "Values, Votes and Slopes - Political Behavior and the Marginal Utility of Income"
"Economic Impacts of Global Terrorism: From Munich to Bali"
American Economic Association Annual Meetings, Boston, January 8, 2006. Comments on "Careers and Advancements within Firms"
3. "Career System Practices: An Examination of Factors Affecting the Development of Managerial Capital", by Schalon Harrison Newton. Wharton Careers and Career Transitions: New Evidence for a New Economy, Philadelphia, June 24, 2005. EALE/SOLE Joint Annual Meetings, June 4, 2005. "Redistributive Taxation and Bankruptcy in US States"
IZA Workshop on Labor Market Institutions, December 3, 2004. "Measuring Heterogeneity in the Returns to Education in Norway Using Educational Reforms"
"Politically-Connected CEOs and Corporate Outcomes: Evidence from France"
"State Television and Voter Information"
Stanford Conference on the Media and Economic Performance, March 6, 2004. "Careers in Firm & Occupational Labor Markets"
Society of Labor Economists Annual Meetings, September 27, 2003. Panel included Bill Walsh, Mike Sullivan, Jim Plunkett, Rick Barry, Jamie Baker, Dennis Gilbert and Larry Baer. Presentation to the Young President's Organization, San Jose Sharks Stadium, February 6, 2003. "Lethal Elections: Gubernatorial Politics and the Timing of Elections"
Econometric Society (ASSA) Annual Meetings, Washington DC, January 5, 2003. "Labour Market Dynamics in the Euro Area: A Model-Based Sensitivity Analysis"
Monetary Policy and the Labor Market in the US, the Euro-area and Japan. A Conference in Honor of James Tobin. New York, November 22, 2002. Comments on "Correlates and Consequences of Domestic Violence for Low-Income Women"
APPAM annual conference, Dallas, November 7, 2002. "When the Giants' Shoulders are Crowded: Fragmented Rights and Patent Strategies in Semiconductors"
Business Environment Conference, Stanford GSB, March 22, 2002. "Why Have Women Become Left-wing: The Political Gender Gap and the Decline in Marriage"